The Yen (¥ / 円 / JPY) is the official currency in Japan. 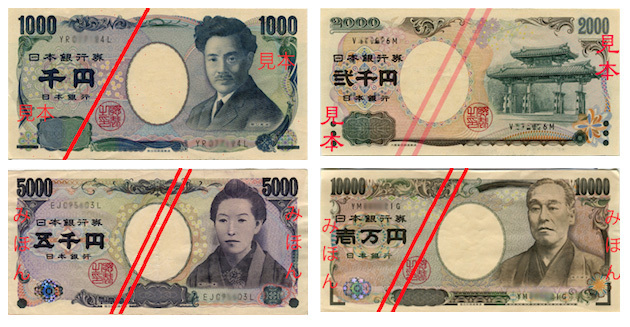 The Bank of Japan issues four types of Japanese paper banknotes, and 6 different coins. The banknotes, with value denominations of ¥1,000, ¥2,000, ¥5,000, and ¥10,000, are produced in slightly differing sizes in descending value order for easy sorting (the ¥2,000 note, decorated with Okinawa’s Shureimon Gate and a scene from the Tale of Genji, is rarely used). 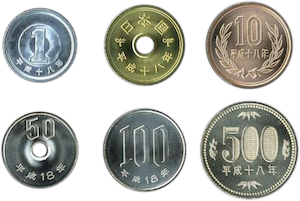 The coins have value denominations of ¥500, ¥100, ¥50, ¥10, ¥5, and ¥1. Both ¥5 and ¥50 coins have a round hole in the middle. ATMs are common in major cities in Japan, though many close at night. ATMs with 24-hour service are available in convenience stores. Consumption tax is 8% but is due to increase to 10% on October 1st 2019. Most food and drink items (excluding alcohol) will retain the lower 8% rate. Take-out and delivery from restaurants will have the lower rate, while eating in will be subject to the 10% rate. Tipping is not necessary; however, a service charge of 10-15% will be automatically included in the bill at many restaurants. This is usually stated on the menu.